I think the posters for my events are quite adorable and amusing. 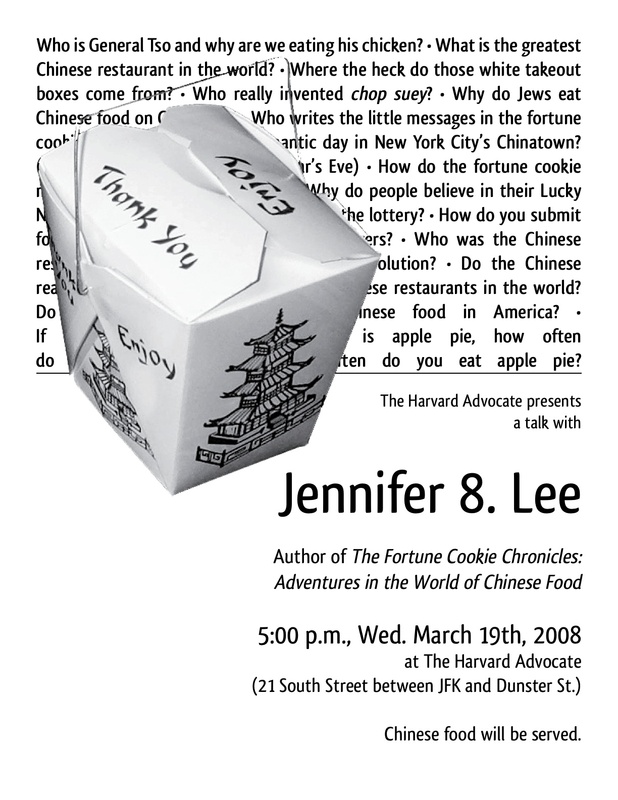 This one from The Harvard Advocate (and another one I will show from the Library of Congress) uses symbols of Chinese-ness (fortune cookies and takeout boxes) that are actually things largely indigenous to America. The takeout boxes are so American they are not really even used in Canada (which is a aluminum and Styrofoam market, as was explained to me). As you will read in the book, invented to hold shucked oysters (why they are still called “pails” in industry vernacular) and then adapted by Chinese restaurants for takeaways.Â The one above is made by Fold-Pak, which is the largest take-out box manufacturer in the country. For all the Crimeds/Crimexecs who have been teasing me because they say it’s treason to speak at The Advocate, I will simply say: They Asked!